Join the discussion on our forums! Come discuss A Light in the Darkness over in our dedicated A Light in the Darkness discussion topic. Wait, how can you have a light in the dark? If you turn on a light while it’s dark, doesn’t that mean it’s no longer dark? A 2/4 Vilefin Inquisitor is great in Arena! Blizzard could rename it to "Tirion in the darkness" , this card is insane even more in arena. Has anyone every compared this to jeweled scarab? Though it isn't a beast and you can discover better/worse than a 3-drop, technically the 1/1 body of the scarab is being added onto the minion you discover. It's all fun and games until the moment I got a second N'Zoth from this on my Wild Reno Pally deck. This is a very underrated card, I currently playing one in my deck. I often get Tirion Fordring, Eadric the Pure, or even better yet, Ragnaros, Lightlord, all with +1, +1. This is card is like combining a banana and raven idol, and generally combining card makes them better. But you wouldn't run banana as a collectible card. I'm just going to take the sentence "This card is like combining a banana and raven idol" and use it out of context, if that's alright with you. Card is actually really good, I see this as a Unstable Portal and Museum Curator. I expect to see this as a two of in every Midrange/Control Paladin deck. Deciding on to take a early or late-game minions in a Midrange shell is just to versatile to give up. +1/+1 is just gravy on already delicious mash potatoes. Glad to see the Discover mechanic brought back in a couple cards this set. Nobody wanted more Inspire cards, and God forbid we ever get another Joust card, but Discover just turned out to be an amazing mechanic. More like Stable Portal since you get to discover the card. 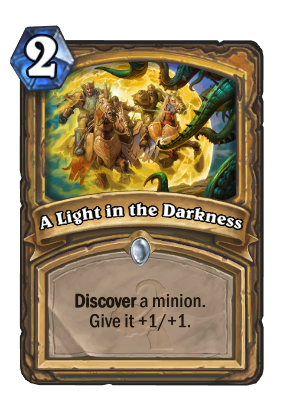 Wow, due to the lack of discover cards in this expansion I thought they will leave the discover mechanic as something exclusive of LoE good to know that this good kind of RNG won't leave us! More discover love please!